Any way you slice it, we're always thinking about food. Tomorrow's food section of The Anniston Star, Your Table, is all about quick and practical. I review a new cookbook for weeknight recipes that are so easy, my 6-year-old daughter can (and did) make them. Salmon, chicken drumsticks and a crowd-pleaser of a tortilla pie. We've got Prudence Hilburn making English muffins and a slew of recipes for Ye Ole Pot of the Crock. Enjoy. Life's too short to eat bad food. Chicken and wok combine in a few new recipes that came our way today from the National Chicken Council. Both call for chicken tenders, which isn't my favorite cut of chicken because of the expense and the tendency to dry out if it's overcooked (a chance that is greatly reduced because of the short-but-intense period of wok cooking). A standard in Asian cooking, woks are also common in many American kitchens, as they provide a fast, easy and healthful method of preparing foods. And while stir-frying may be the cooking method most associated with woks, they can also be used to braise, stew, steam or even deep-fry things like chicken. Stove-top woks, suitable for either gas or electric ranges, or electric woks with a non-stick finish, all work equally well. Their round-bottom shape provides uniform heat distribution, ensuring a quick cooking time. From the National Chicken Council and the U.S. Poultry & Egg Association, here are two new chicken recipes to try in a wok. Both can also be prepared in a large frying pan, cooked over medium high heat. 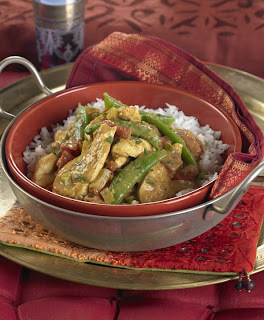 Chicken and Sugar Snap Pea Curry is a spicy delicious dish that features boneless, skinless chicken breast halves, sliced to a two-inch size. Start by making a curry sauce: sauté onion, curry powder, chili powder, diced jalapeno pepper and ginger in a saucepan, and add canned tomatoes and coconut milk. Cook the chicken pieces in the wok, along with whole sugar snap peas. Combine the chicken and peas with the curry sauce and serve over a favorite rice, like basmati. Add steamed carrots or zucchini, or grilled eggplant to complete the meal. Chipotle Chicken, Sweet Onion and Cabbage Tacos is another fast and easy meal that is full of Southwest flavors. Cook diced onion in the wok, along with hot pepper sauce, cumin and sliced chicken tenders. When finished cooking, add lime juice for a cooling tang. 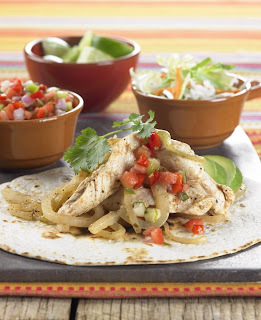 Serve the chicken mixture on warmed tortillas, along with bagged coleslaw mix, cilantro, diced avocado and bottled salsa. Black beans and rice would be a perfect complement to this dish. In medium saucepan over medium-low heat, warm 1 tablespoon canola oil. Add onion, curry powder, chili powder, jalapeno pepper and ginger. Cook, stirring occasionally, until onion is translucent, about 4 minutes. Add drained tomatoes, coconut milk, salt and pepper. Increase heat to medium high and bring mixture to a boil; lower heat to simmer and cook until sauce has thickened, about 10 minutes. Remove from heat and set aside. Add 2 tablespoons canola oil to a wok and place over high heat. When oil is hot, add chicken slices and coriander, stirring constantly. Cook chicken until almost done (about 5 – 7 minutes) and add sugar snap peas. Continue to cook, stirring, 3 minutes. Combine chicken and curry sauce mixture; simmer 3 – 5 minutes to blend flavors. In wok, heat oil over high heat. Add onion and cook, stirring and tossing, for 5 minutes or until onion is translucent. Add hot pepper sauce, cumin, salt, pepper and chicken. Continue stir-frying for 5 to 7 minutes, or until chicken is just cooked through. Add lime juice and remove from heat. To serve, place a small amount of the chicken and onion mixture in the middle of a warm tortilla. Top with coleslaw mix, cilantro, avocado and salsa. Add dollop of sour cream; fold both sides of tortilla over the ingredients. The pressure cooker that I bought several weeks ago continues to come in handy. It's a 6-quart Presto model, and it whipped up a super-duper cheap dinner in 20 minutes Monday night. 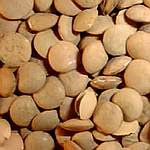 I took a whole, 1 pound bag of green lentils (79 cents), rinsed them in a colander, then popped them in the pressure cooker pan. I added a tablespoon of olive oil (that's to keep them from frothing) and added enough water to cover them by two inches. I added a 1/2 teaspoon of black pepper, 1/4 teaspoon each garlic and onion powder, 1 teaspoon dried thyme leaves and a pinch of dried, ground mustard. I sealed the cooker, raised the heat to high. After the regulator/weight started to do its little dance, I reduced the heat and let them cook for 3 minutes. I then cut the heat, set the cooker off the stove and let the pressure come down in several minutes' time. The result: a nice, thick lentil "stew" that, seriously, tasted as though they'd cooked all day in the crock-pot. Very hearty. Very filling and super tasty. Dinner for four (and lunch the next day for three) for 79 cents TOTAL. No less than six recipes this week calling for 'agave nectar' instead of sugar. I'm as freewheeling as the next foodie, but that's a bit much even for me. Lots of recipes call for polenta these days. I love polenta, but making it from scratch (Your mama would have called it cornmeal mush, by the way) takes time. Never fear. Spotted at Winn-Dixie in Golden Springs Thursday night: a pack of ready-to-serve polenta on the shelf in the Italian food section. Also on tap at the WD: pearl barley, which is big in some Mediterranean cuisines and is a super, super cheap way to stretch soup and stew recipes to feed a few more people. Fall is a fabulous time of year -- not just because the weather is beginning to tone down, but because It's Cookbook Season. A handful of new books have come under the door this week. They look great and promise to add to the pile of food lore coming your way. Another treat: It's beginning to smell a lot like Christmas. The first wave in the Annual Christmas Cookie tidal pool came in the mail today. Land o' Lakes came across with a quintet of cookie selections. Good stuff. We'll make 'em, eat 'em and let you know how they turn out. In addition to Garland's zingy sandwich, we explore new ways to cook bratwurst, a super-fast fish dish and try to venture out into the vegetable kingdom with fennel in a nice, crisp salad. Prudence Hilburn leads a tour of cakeland.... and that's balanced nicely with the nutritionist from The Biggest Loser talking diet secrets of the formerly fat. Hungry for a good story? 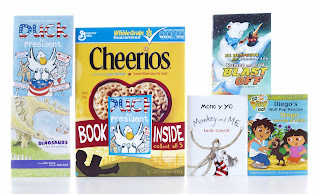 The folks at Cheerios have added a prize worth digging out of a cereal box: children's books. Anyway, the Spoonfuls of Stories campaign puts small, paperback books inside 5 million boxes of Cheerios. The program kicks off next month, and you can see the book that's in the box through a see-through cover on the box front. That will make sure you don't get 20 copies of Duck for President, which is one of the selections. Diego's Wolf Pup Rescue, Monkey and Me, Romeo and Lou Blast Off and When Dinosaurs Came with Everything. We've run this before, but a reader requested it again. Enjoy. 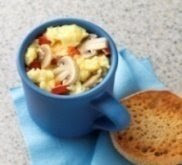 Lightly spray the inside of a microwaveable mug with non-stick cooking spray, place mushrooms in mug and sprinkle with salt and pepper. Cover and microwave for 1 minute. Let rest 30 seconds and drain any excess liquid. Add whole egg and egg white to mug and mix well with a fork. Add cheese and tomato or red pepper (if desired) and microwave for 1 minute, stirring halfway through. Let rest 30 seconds to allow eggs to finish cooking. Enjoy in the mug or on a toasted whole wheat English muffin. In a large bowl, prepare the 3 bags of falafel mix according to the package directions. Add in 3-4 tablespoons of water to make the batter a spreadable consistency. Set the batter aside. Coat each chicken breast with flour, shaking off the excess. Heat 3 tablespoons olive oil in a large skillet over medium heat. Dip one side of each chicken breast into the prepared falafel mix. Pat it on to form a crust. Add to the hot oil, falafel side down, allowing the crust to form before flipping to cook on the other side, about 4-5 minutes per side. Meanwhile, cut the tomatoes and cucumbers into medium dices. Serve the falafel chicken with the diced tomatoes and cucumbers, and a dollop of hummus. Sarah Lasry, professional chef, Manischewitz resident recipe expert and author of the acclaimed cookbook, The Dairy Gourmet, recommends her delicious, savory crepes. Wrap crepes around the completed filling. Entries must be received by Dec. 31. Enter your recipe online or mail to the address below. The website also provides simple kosher guidelines. Top submissions will be selected by a judging panel including chefs, food writers, and executives. Those recipes will be prepared under the direction of a professional chef and tested by the panel. Six finalists will be selected to compete live in the New York City finals in February 2009 and one Grand Prize Winner will be selected at the final cook-off event. A panel of food experts will judge the recipes on site based on the following criteria: taste, 50%; ease of preparation, 20%; appearance, 15%; and originality, 15%. The six finalists will be selected to compete for the Grand Prize in New York City in February 2009. All finalists will win a $2,000 (ARV) prize package including a trip to New York City to compete for the grand prize. The Grand Prize winner receives a $25,000 (ARV) prize package including: state-of-the-art GE Profile Kitchen appliances, a $5,000 check from Manischewitz; inclusion in a future Manischewitz or web cookbook; Manischewitz product and more! With Rosh Hashanah and Yom Kippur around the corner this competition encourages everyone to submit their favorite kosher recipe, especially since great Jewish food and kosher dishes are among the ethnic cuisines on the rise. Almost any favorite dish you, a friend or family member enjoys can be adapted to meet kosher guidelines and standards! It's never too soon to talk turkey. Really. According to the U.S. Census Bureau, $3.86 billion in turkey sales was forecast for 2007. With Thanksgiving just around the corner (trust us, it will be here before you know it), many people are already in the planning stages for this year’s holiday meal. With the current economic issues that many families are facing, they are looking for ways to save money, this year. According to Chef Paul Magnant, dean of culinary and hospitality at Stratford University, the turkey is the first place to look for cutting costs. To do this, he suggests that consumers consider buying bone-in turkey breast. This is because, although whole turkeys tend to be the most popular option, they only provide 40 percent of the weight-yield after cooking. Therefore, that typical $.99 per pound really amounts to over double what was paid at the register, when you consider what is edible after cooking. “Another tip is to use Pepperidge Farm stuffing found in the bag at the supermarket, affirms Chef Magnant. The spices and herbs will make a great addition to the meal. They are the only company that I know of that incorporates the herbs and spices into the bread dough before baking,” he says. Stratford University’s culinary arts program offers several degrees, including concentrations in baking and pastry, as well as advanced culinary arts. The school also offers non-degree public one-day culinary courses covering such topics as beginner baking, knife skills, vegetarian cooking and cake decorating, as well as parent-and-child cooking. If you want to find out if Creole and Cajun are interchangeable, all you need to do is go to good ole' south Louisiana and mention that you believe there's no difference. Let's begin with the Creoles — they are the city dwellers. Originally the term Creole was not reserved for residents of New Orleans, but today the best way to describe a "true Creole" is a New Orleans native whose heritage includes the Native Americans, French, Spanish, African, Italians, and others that settled the city. This melting pot is best illustrated through the food that developed when all these collided. As you may know, bouillabaisse is a soup/stew that came from France. The Africans brought okra from their home soil, and the Native Americans introducing new ingredients like file powder and bay leaves. At this intersection of cultures there was a three-car wreck, and gumbo came stumbling out. Creole is a cuisine that developed by drawing from all these ethnic backgrounds with particular influence from the African Americans who were not only the cooks at home, but also the cooks in professional kitchens. Now Cajun came from the French-speaking Acadians — folks originally banished from France who then fled to Nova Scotia. They were kicked out of Nova Scotia in the early 1700s and settled in rural southwest Louisiana. While the Creoles were cosmopolitan, the Cajuns throughout their history were fairly isolated. They were great farmers, fisherman, and hunters and truly lived off the land. Creole food was served in restaurants from its earliest days, but Cajuns served country food, often one-dish meals, not found on public menus until midway through the last century. Cajun cuisine is spicier and incorporates a lot more hot peppers than Creole. In Creole seasoning, you will find more herbs and more subtle flavors, whereas in Cajun dishes you will find their "holy trinity": cayenne pepper, white pepper and black pepper. For each recipe, combine all ingredients well and store in an airtight container. An Anniston woman has taken a top prize in the America's Best Sandwich contest, sponsored by Mezzetta. America's top producer of specialty olives, peppers and other gourmet ingredients announced today that Edwina Gadsby of Great Falls, Mon., won the Grand Prize is $25,000 and a trip for two to Napa Valley. This is the first year Mezzetta, a family-owned food company founded in 1935, has sponsored a national recipe contest. Gadsby, no stranger to the world of recipe contests, was nonetheless stunned when she found out she had won Grand Prize. She had been intrigued been the idea of creating a prize-winning sandwich, and spent hours in the kitchen testing her ideas. “Gourmet sandwiches are comfort food at its best. Unlike so many other “gourmet” meals there is no intimidation factor when it comes to sandwiches. The only limit to the combinations you can come up with is your imagination.” Gadsby observed. The Make That Sandwich contest accepts entries in four categories: Hot, Cold, Vegetarian and Hero. Gadsby entered her sandwich in the Hot sandwich category. Finalists in the other three categories each received $1,000. The Seventh Annual Jif Most Creative Peanut Butter Sandwich Contest is accepting entries from now until Nov. 14. Encouraging kids ages 6-12 to invent new creative peanut butter sandwich recipes is a great way for parents to foster creativity in their children and spend quality time together while having fun in the kitchen. To make the dipping sauce, combine all ingredients in small saucepan and cook over low heat while stirring with a wire wisk. When the mixture starts to bubble and thicken, remove from heat and let cool. While the dipping sauce is cooling, roll flat with a rolling pin the four slices of bread. Use a large circle shaped cookie cutter to cut out each slice of bread into a circle. Mix the 3 sandwich mix ingredients together in a small bowl. Place a tablespoon full of mix into the center of each circle shaped piece of bread. Fold the bread in half so the sandwich is now a half circle. Crimp the edges of the sandwich together with your fingers so the mix will not come out. Then, while holding the center of the sandwich, pull the sides of the sandwich down so the edges touch each other, forming a fortune cookie shape. Cut extra apple and celery slices to eat with the Chinese dipping sauce. To make fortunes for your fortune cookies, use a clean plastic lid from a tub of butter, yogurt, or sour cream. Cut small plastic strips, then write your fortune on them with a permanent marker. Tuck the edge of the fortune into the edge of your cookies to make them real fortune cookie sandwiches. Once the dipping sauce is cool, serve the crunchy Chinese cookie sandwiches with their fortunes, and apple and celery slices on a plate with a cup of dipping sauce. Dip the sandwiches and the apple and celery slices into the sauce, and you have a great after school snack that was fun to make and eat! A 4-day, 3-night trip to New York City with a companion. A seat at the judges’ table at the Seventh Annual Jif Most Creative Peanut Butter Sandwich Contest final event. The FDA is reportedly considering quietly dropping the "import alerts" for five species of Chinese seafood imports, including catfish and shrimp, that were put in place during the summer of 2007. As a refresher, that was the "bad summer" for Chinese imports -- of lethal toothpaste, pet food, lead-painted toys, and contaminated seafood. The import alerts require chemical testing for entry into the U.S. Unfortunately, the private lab testing system, as described below, is rife with abuse and deception. Not surprisingly, after a year of this the FDA is declaring victory over contaminated Chinese seafood, since they are not hearing too much any more about contaminated shipments, and are considering dropping the testing requirement. While the testing requirement as currently constructed is little more than a "fig leaf" for a dysfunctional system, it at least forces importers to go through the motions. Given the Chinese track record on consumer safety issues, and the FDA's inability to monitor and police imports, the last thing the Administration should do would be to remove even this minimal level of protection. More importantly, dropping the import alerts for these items would cause the December (2007) trade agreement with China to kick in. Under this agreement, the U.S. would essentially outsource its seafood inspections to the Chinese Government and its designated producers. As discussed below, the Chinese food safety agencies are very much a work in progress, are in considerable turmoil, and have a very poor performance record. Is this really the system to which we want to entrust our seafood inspections? The events of this past summer again underscore the need for a workable U.S. inspection system -- repeated outbreaks of illness both at home and abroad that were exacerbated by under-funded, inadequate, and overwhelmed inspection systems. In the waning days of the current Administration, behind the thick fog of the elections and the rhetoric, the FDA could well cave in to the demands of Chinese importers and their free-trader corporate allies to eliminate any meaningful examination of incoming containers. They will claim that the "problem has been solved" and that the action will produce "greater efficiency," "less regulation," and "less bureaucracy." We disagree. The J.M Smucker Company is partnering with The National Center on Addiction and Substance Abuse (CASA) at Columbia University to celebrate Family Day – A Day to Eat Dinner with Your Children, which will be celebrated on Sept. 22 this year. To help consumers prepare for Family Day, Smucker is offering a free, online chat with The Surprising Power of Family Meals author Miriam Weinstein on September 16, 2008. Readers can visit www.poweroffamilymeals.com between 8 – 10pm EST to chat with Weinstein, who will provide insight into the importance of family meals, tips on how to make it a part of your routine every day, and creative ways to make these occasions special. Family Day is a national movement that reminds parents that dinner makes a difference and encourages parents to frequently eat dinner with their kids and be involved in their children’s lives. CASA’s research consistently finds that the more often kids eat dinner with their families; the less likely they are to smoke, drink or use drugs. Family Day helps remind busy families of the invaluable role that parental involvement plays in steering children and teens away from negative influences. Apples, galore. This time with fire. Apple season is upon us, and the chefs of The Culinary Institute of America suggest that you take advantage of this opportunity to select a variety of apples. Such a versatile ingredient as the apple can be prepared in numerous ways; whether baked, grilled, or roasted, each particular variety has characteristics that make it unique. With apples in such abundance, now is an excellent time to take them home and experiment to determine which apple variety is your favorite. "In New York's Hudson Valley we have no shortage of apple varieties. Early September apples such as Paula or Ida Red, cousins of the McIntosh, will work well for this recipe if they are not over-baked," explains Carol Hawran of The Culinary Institute of America in Hyde Park, NY. "Rome Beauty, Empire, or Golden Delicious apples are always reliable standbys as they have enough body to hold their shape well." Baked apples are ideal for a warm day and can be made right on your grill. Put them on just as you take off your dinner, and by the time you've eaten and brewed coffee, the apples are ready to eat. Apple Crisp, with a sweet crumbly topping made with oats, will warm up any cool evening. Top it with a wedge of cheddar cheese or a dollop of lightly sweetened whipped cream for a dessert that is sure to please. These and other recipes can be found in The Culinary Institute of America's cookbook, Grilling (2006, Lebhar-Friedman), available for purchase at bookstores nationwide. Here's a video demonstration featuring how to prepare Baked Apples filled with Walnuts and Cream. Preheat a gas grill to medium. If you are using a charcoal grill, build a fire and let it burn down until the coals are glowing red with a moderate coating of white ash. Spread the coals in an even bed. Clean the cooking grate. Combine the walnuts, brown sugar, butter, prunes, and lemon zest, and mix until evenly blended. Pack the mixture into the cored apples. Cut 8 large rectangles of foil and fold each in half to make squares. Set 1 filled apple in the center of each square. Drizzle each apple with some of the Calvados (less than 1 teaspoon per apple) and a little of the maple syrup (less than 1 teaspoon per apple). Pull up the sides of the foil around the apple to make a vented pouch. Grill the apples over direct heat until soft and the juices that collect in the bottom of the pouch are a rich brown, about 35 to 40 minutes. Turn the pouches occasionally as the apples cook. Whip the heavy cream just until lightly thickened and still somewhat runny. Whisk in the remaining maple syrup. To serve, place a baked apple on each serving dish. Pour the accumulated juices from the foil pouches over the grilled apples, and then spoon some of the whipped cream over them. Nutrition analysis per 7.5-ounce serving: 270 calories, 1g protein, 46g carbohydrate, 10g fat, 30mg sodium, 30mg cholesterol, 6g fiber. In the midst of a very busy and stressful fall – with kids heading back to school and parents with reloaded work schedules -- healthy eating can take a backseat. Well, these easy to make and eat healthy fall treats can help. They’re a great alternative to junk food for kids heading back to school and good for a stress – but not diet – busting snacks for worn out parents anytime. And since they use healthier ingredients – like Smart Balance Butter Blend Stick with Omega 3 – these snack treats are missing one thing families won’t mind forgetting about this busy autumn: the guilt. First Layer: Stir together dry ingredients. With pastry blender, cut in Smart Balance Butter Blend Stick until pieces are size of peas. Add eggs and vanilla, mix well. Press dough onto bottom and sides of ungreased 10 ½ x 15 ½-inch jelly roll pan. Second Layer: Bring water and sugar to a boil and stir until sugar is dissolved. Add cranberries and cook on low heat for 10 minutes, stirring occasionally. Cool. Mixture will thicken as it cools. Spread over first layer. Bake 325 degrees for 30 minutes. Cool. Combine the Smart Balance Omega™ Peanut Butter, Smart Balance® Butter Blend Stick, brown sugar and sugar substitute in a large mixing bowl. Using an electric mixer on high setting, beat until well blended and creamy. Using a measuring teaspoon, spoon rounded teaspoons of the batter onto cookie sheets coated with Smart Balance® Cooking Spray and bake 3 minutes. Do not cook longer. They will be slightly puffed and a very light golden color on the bottom. (Note: They will not appear to be done at this point, but will continue to bake while cooling). Remove from oven, and immediately place on cooling racks to cool completely. Repeat with remaining batter. Alternate cookie sheets while baking, using a cooled sheet for even baking. The Chewy Peanut Butter Oatmeal Cookies were developed by food consultant Nancy Hughes especially for Smart Balance, Inc.
Place sliced fruit in a 8” X 8” X 2” baking dish that has been coated with Smart Balance® Cooking Spray. Stir in the 3 tablespoons of sugar. In a small mixing bowl, combine oats, flour, cornstarch, brown sugar, and cinnamon. Cut in Smart Balance® Butter Blend until mixture resembles course crumbs. Stir in chopped nuts and sprinkle evenly over fruit. Bake at 375 degrees for 30 to 35 minutes or until topping is golden brown. Serve warm. Delicious with frozen yogurt, ice milk, or reduced fat whipped topping. Blueberry variation: Mix 5 cups fresh blueberries with 3 tablespoons sugar and ¼ cup all-purpose flour. Prepare with topping as above and baked as directed. Besh in NOLA. A good thing. They say that anything worth doing is worth doing right, and, judging by New Orleanians’ votes, Chef John Besh must be doing a lot of things right. Chef Besh and Besh Restaurant Group [Restaurant August, Luke, La Provence, Besh Steak] recently captured four prized spots on Gambit Weekly’s annual Best of New Orleans Reader Poll. Clenching the top honors, Chef John Besh received the coveted Best Chef title. Lüke, the newest member of the Besh family of restaurants, burst onto the New Orleans dining scene when it opened its doors in May 2007. This year, Lüke makes its debut on the Gambit newspaper poll as one of the top three Best Hotel Restaurants. No stranger to gracing ‘Best’ lists, Besh’s original New Orleans restaurant, Restaurant August has an impressive array of wines imported from boutique wineries from France, Italy and the United States, which helped land the restaurant among the top three winners for Best Wine List. Bringing Besh Restaurant Group’s total number of appearances on the list to an even four is La Provence. Located just outside of New Orleans in Lacombe under the guidance of 2001 Food & Wine Best Chef Randy Lewis, Gambit readers voted this provençal aberge as among the top three on the Best Northshore Restaurant list. These latest accolades are but the most recent in what has been an impressive summer for the Besh Restaurant Group. Just last month John Besh was named Restaurateur of the Year by the Louisiana Restaurant Association for 2008. A new study published online today in the British Journal of Nutrition found that timing of dietary protein intake affects feelings of fullness throughout the day.The study concluded that when people ate high-quality protein foods, from sources such as eggs and lean Canadian bacon, for breakfast they had a greater sense of sustained fullness throughout the day compared to when more protein was eaten at lunch or dinner. "There is a growing body of research which supports eating high-quality protein foods when dieting to maintain a sense of fullness," said Wayne W. Campbell, PhD, study author and professor of Foods and Nutrition at Purdue University. "This study is particularly unique in that it looked at the timing of protein intake and reveals that when you consume more protein may be a critical piece of the equation." The study included overweight or obese men who ate a reduced calorie diet. The diet consisted of two variations of protein intakes, both which were within federal nutrition recommendations: normal protein intake (11-14 percent of calories) or increased protein (18-25 percent of calories). The researchers tested the effect of consuming the additional protein at specific meals - breakfast, lunch or dinner - or spaced evenly throughout the day. Purdue researchers found that the feeling of fullness was greatest and most sustained throughout the day when the additional protein, from eggs and lean Canadian bacon, was eaten at breakfast - versus lunch or dinner. The authors of the British Journal of Nutrition study note that most Americans typically consume a relatively small amount of protein at breakfast - only about 15 percent of their total daily protein intake. "It strikes me that there is a real opportunity to increase protein intake at breakfast to see a meaningful impact on people's weight loss efforts," said Keith Ayoob, EdD, RD, FADA, a nutritionist and associate professor of pediatrics at the Albert Einstein College of Medicine. "Many people are caught in a boring breakfast rut, or say they simply don't have enough time to eat in the morning, but with a little planning, breakfast can easily be one of the most fulfilling meals of the day." · Cook Once, Eat Twice: Use last night's leftover vegetables as fillings for an easy-to-prepare omelet ready to eat in less than two minutes. In addition to the leftovers, fill the omelet with lean Canadian bacon and low-fat cheese for additional flavor and protein punch. · Wake Up Right: Start the day off right with a balanced breakfast that pairs high-quality protein, like yogurt or low-fat dairy, with healthy carbohydrates, such as those found in fruits, vegetables and whole grains. · On The Go: For a breakfast meal you can take with you in the morning, try a wrap! Add lean Canadian bacon and low-fat cheese and any other preferred toppings to scrambled eggs, and then spoon into a warm whole wheat tortilla. Fold the tortilla, cut it in half and take it to go. · Family Fun: Make breakfast fun for the whole family by serving up creative dishes, like green eggs and ham. Simply add spinach to scrambled eggs and serve with ham for a fun and easy dish that the whole family can help prepare. Summer is coming to an end, and with it the mid-year feasting season. That means one more picnic, one more backyard barbeque, one more beach party, and one more opportunity to enjoy a great burger by choosing the right flavor of iced tea. According to the experts at Turkey Hill Dairy – makers of the nation’s number one selling refrigerated iced tea – wine isn’t the only beverage that deserves scrutiny when pouring at your next meal. Summer feasts can also be foiled by sipping peach tea with chicken salad or green tea with barbequed ribs. Just as wine aficionados have their own set of guideleines for food and beverage interactions, so do iced tea fans. · Chicken and pasta are neutral foods that pair well with most teas, but the sauces will make the difference when selecting the right beverage. Choose a richer, fuller-bodied tea like Turkey Hill’s Sweet Tea for heavy, meaty sauces. With lighter, cream-based sauces, try a drier option like Green Tea. · When in doubt, go with regular iced tea. “Turkey Hill’s standard tea is a very balanced, middle-ground beverage that seems to pair well with just about any food,” said Wright, who also suggested most diet teas, which tend to be drier and slightly less sweet, as other neutral options. A beautiful, dark and rich dish, this one takes almost no effort and is ready in an hour. Serve with a salad, and you're set. Mix all ingredients in a bowl, along with the chicken, of course, and let marinate for 30 minutes. Place chicken in an even layer in a baking dish and bake at 375 for 25 minutes. Tapioca is from the root of the cassava plant.